Much of the curriculum I use is purchased, and I have provided links to those products on my Course Schedules page for each subject. I will list them at the bottom of this page as well. 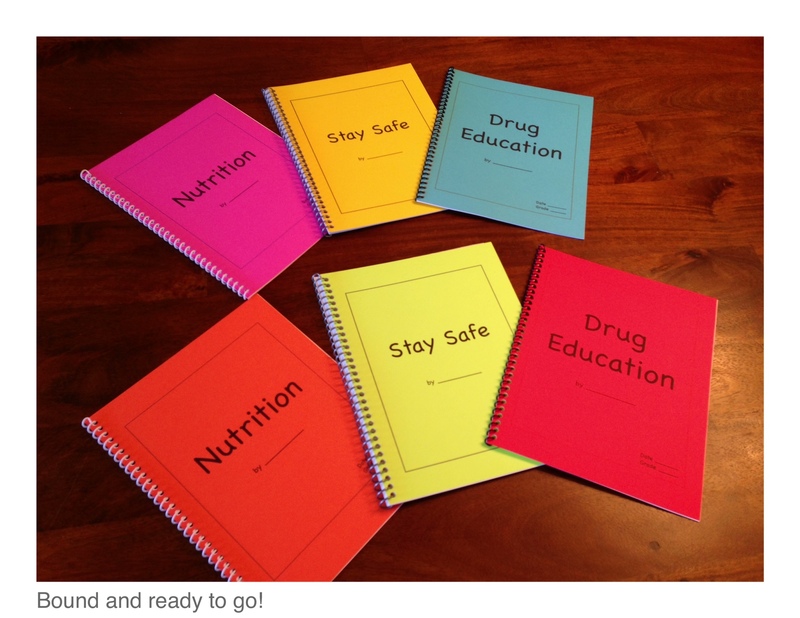 This Curriculum page, however, is dedicated to the curriculum that I design myself. Sometimes it is to enhance the curriculum I purchase (science, history). Sometimes it is standalone (health, art). When possible, I will provide PDF downloads. The parts that say text or pics will be replaced with, obviously, text or pictures when we do the write-up. These are just notes I made for myself, since I prepared all the lab sheets ahead of time. I recommend you do the same if possible. I find that the less work I have to do on the actual day of school, the more likely we are to complete all I have planned. You may also notice that I don’t include the procedure on my lab sheet. I’ve decided that it’s not critical that they include that in 2nd and 4th grade. 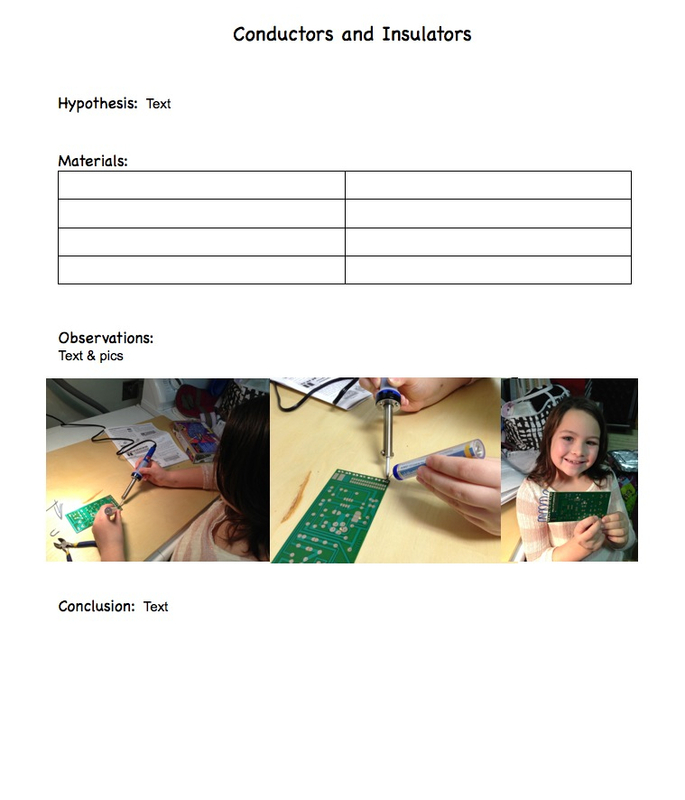 I don’t want to overwhelm them with writing, and we can easily refer to the experiment book if we need to review the procedure at a later date. I’d rather they focus on their observations and conclusion at this age. Since my lab sheets are based on Elemental Science, I’m not going to post the blank sheets here. But, you can follow my format to create your own. 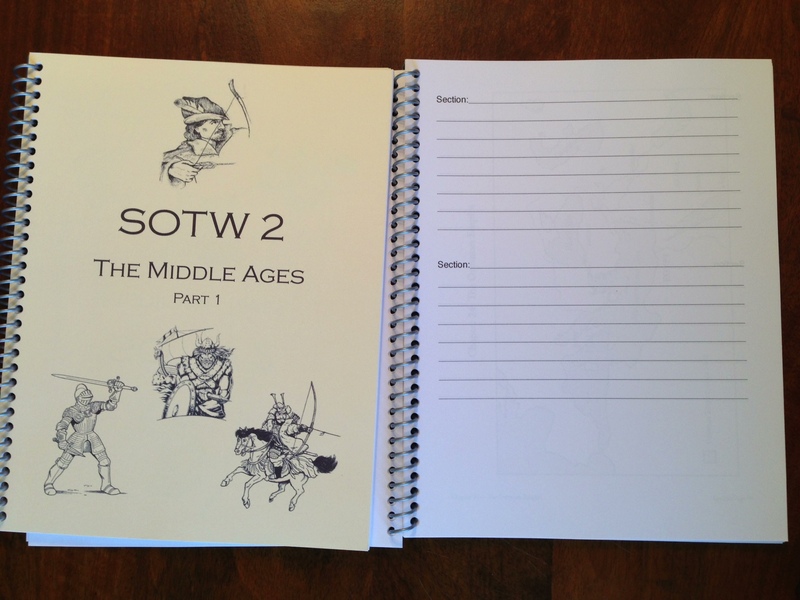 We use SOTW for our history spine. I’m finally starting the reap the benefits of homeschooling more than one kid, as I am able to reuse the SOTW 2 activity book this year. I used this book with Ashby two years ago and didn’t have to buy it this year for Ryan. Yay! I disassembled the activity book (actually removed the cover and tore the pages out carefully). Then I split it into two parts: Chapter 1-21 and 22-42. 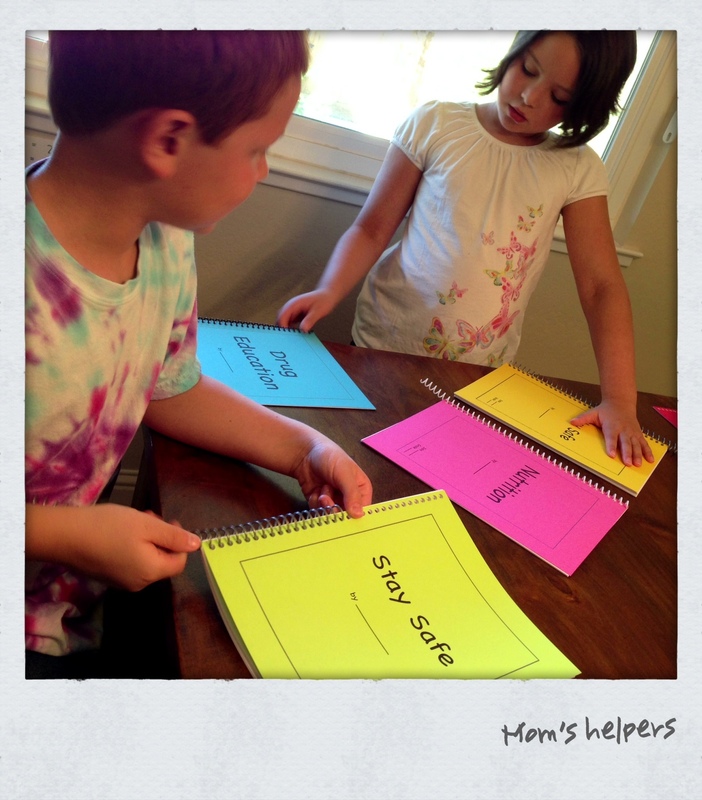 (The activity books are on the left side in the picture above…blue covers. 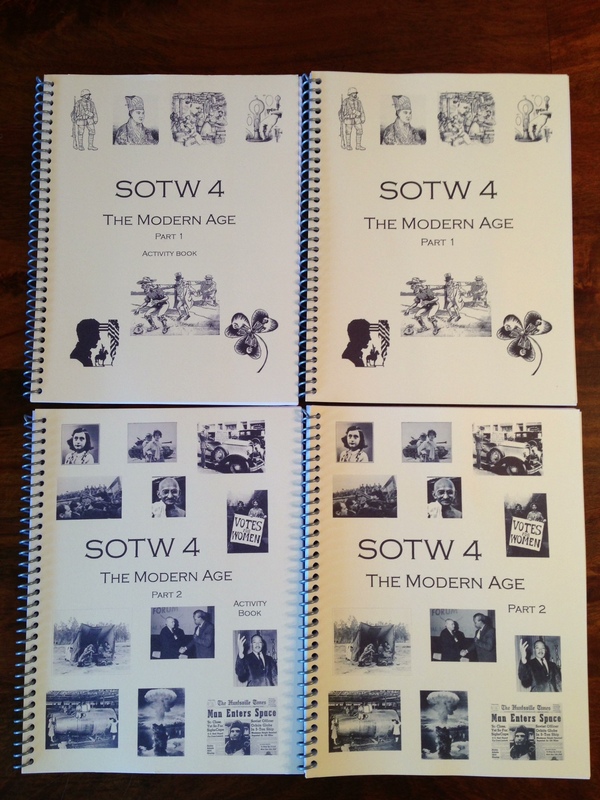 Part 1 has the actual SOTW cover; Part 2 has a cover I made). 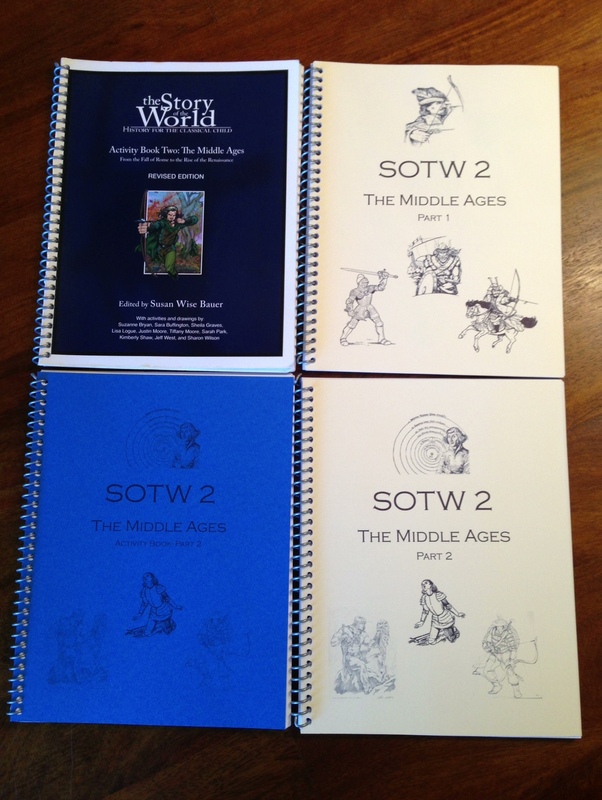 These books contained all the teacher pages from the original SOTW activity book. I made a separate pair of books for Ryan (on the right side) with all the maps, coloring pages, and narration sheets. Ashby is doing SOTW 4 this year. I ordered the PDF version of her activity book this year and printed it out myself. Since I’m binding it into two books, this the PDF version is great! I like to find related graphics to decorate the covers of our history books. Now that Ashby is doing The Modern Age, I was able to find actual photos (though sifting through them was a bit depressing, since much of our modern history involves war and oppression). 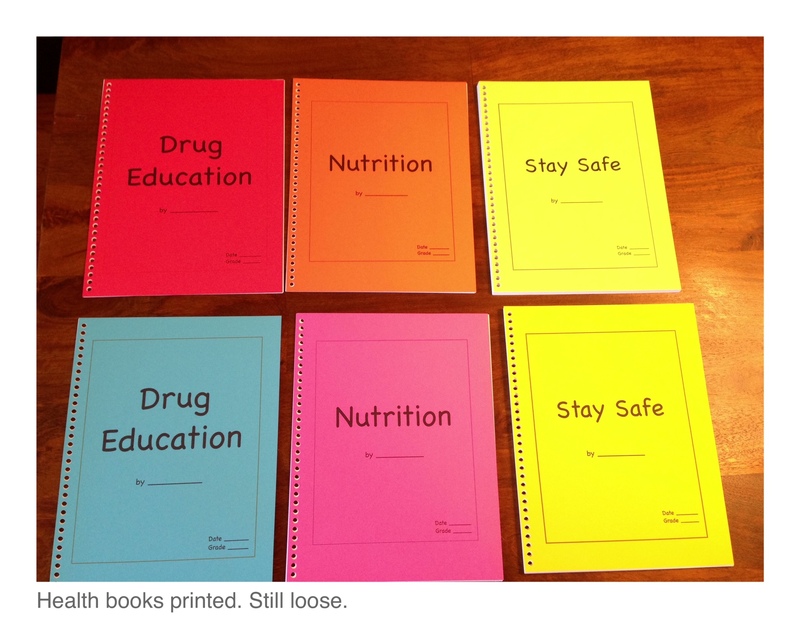 I’ve built my own health curriculum to use with both kids (grades 2 and 4). It’s a combination of the information in my Health Course Schedules for the two grades. Unlike our other subjects, health is flexible and often can be taught to both grade levels at the same time. I’ve made three different books to go along with our three main units. We use these books in conjunction with the websites and resources detailed on the course schedules. I use different colors to identify which books are Ashby’s and which are Ryan’s. The kids love to help me bind the books. I use coil bindings. They look professional but can be modified easily if necessary. I have three different sized coils to hold books of varying thickness. These PDF files contain links to pages I include in my finished books. Print out the pages and insert them in place of the link pages. (I recommend opening the links in a new tab of your internet browser (⌘-click on a Mac) so that you don’t lose your place in the original file every time you open a link).